I am always looking to order things online, just makes life more simple. So glad I ordered from here! Arrived fast and in great condition! Oak Leaf Hydrangea - Hydrangea quercifolia is a shrub that is native to the northeastern part of the country. Hydrangea Oak Leaf is easily identified by the panicle flowers that are greenish-white in color. As they age, the blooms may have shades of pink and brown. Hydrangea Oak Leaf has bright-green leaves can grow as long as 12 inches. Hydrangea Oak Leaf change to red and dark brown as autumn approaches. During the winter months, the hydrangea's dark bark is exposed. The hardy plant is tough, drought resistant and free and pest free. Ideally, they grow best in sunny areas during the morning and shady during the evening. 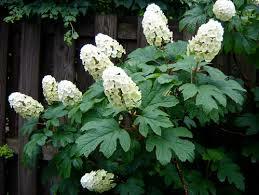 Oak Leaf Hydrangea shrubs are great for flower gardens and to plant on a lawn. Hydrangea Oak Leaf will do well in various soil types as long as it is well drained. 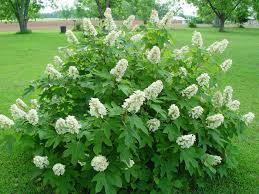 This shrub will work well in natural areas. Hydrangea Oak Leaf is an excellent shrub and can be enjoyed in many ways. This shrub will look beautiful when the cuttings are used in a vase to create a stunning arrangement. These arrangements can spruce up a table or any room in the home. This shrub is simple and very easy to take care of and grow. As long as the soil and light conditions are right, this shrub will thrive. Oak Leaf Hydrangea will look amazing when growing in a garden. The Hydrangea Oak Leaf can grow to be up to 10 Feet tall and about 4 feet wide. This species of the hydrangea family is not too picky about the type of soil, as long as it is fertile and well drained. When this blooms, it features gorgeous white and sometimes off-white large blooms that are just perfect for cutting off and enjoying them in the home.